118 Kirkintilloch Road, Glasgow. G64 2AB. Tel:01417623131. This very old tavern was remodelled in 1902 by architect Alexander McDonald. Before the old inn was remodelled it only had one turret. The tavern was established in 1827, it was then just a small pub then with three houses above. The Crow Tavern has it’s very own ghost, many strange things have happened in the upstairs lounge, water taps have been mysteriously turned on during the night. A strange figure was captured on a modern mobile photo one night as a customer took a picture of the bar. An early photograph of the Crow Tavern with a tram heading for Springburn. Mr Walter MacFarlane took over the licence 1922, and had the premises altered in 1940 and 1950 he had been here for 28 years and designed the interior, he got his inspiration from the Buchanan Castle Golf Clubhouse. The half-moon public bar counter and fittings were made from solid oak and the bar had a heavy mullioned glass door. The lounge bar was spacious with tartan hangings and pictures of scenes from the neighbourhood and old pictures of the Crow Tavern. A coat of arms of the MacFarlane’s adorned the tavern’s doorway. When Mr MacFarlane took possession of the tavern there was still in existence an old sunk well, for which a bucket and tackle still hung behind the door of the inn. Mr MacFarlane was from a well known family of publicans his brothers Alexander and John had pubs in Springburn Road and Govan Road. View of the Crow during the 1950s. The customers used to tell the tale of two murders that occurred near the old Crow Tavern, an English ganger was murdered by two Irish labourers during the building of the railway and the other the murder of a police inspector just outside the pub towards the end of the 1800s. 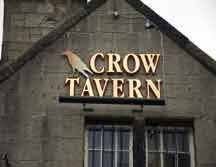 The locals would tell strangers that visited the Crow that the pub was crowded that day when the labourers were hanged for the execution took place within sight of the scene of the crime. 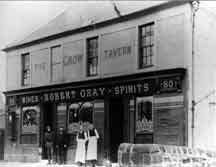 This is the earliest photo known of the Crow Tavern with Robert Gray as landlord. 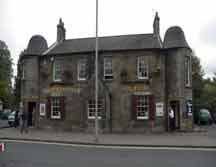 The nearest public house to the Crow Tavern was Quin’s at Bishopbriggs Cross and heading to Springburn your first stop would be the old Boundary Bar.